Abrasive Discs work with hard-to-grind materials. With blaze orange grain-side color, Norton SGÂ® BLAZE R980 discs cut materials such as stainless steel, cobalt, chrome, inconel, and titanium. Conical shaped Type 29 flap wheels; single- and 3-ply Speed-Lok discs; and Type 27 flat discs feature wear resistant ceramic grain, polyester backing, and grinding aid. Each grain continually fractures in grinding process, along sub-micron faults in crystalline structures, repeatedly exposing new sharp cutting edges. Sporting a distinctive grain-side color - blaze orange - the new Norton SG® (seeded gel) BLAZE R980 discs have demonstrated in side-by-side production tests their ability to cut faster than any other disc, enabling manufacturers to lower total grinding costs on stainless steel, cobalt, chrome, inconel, titanium and other hard-to-grind materials. Originally available in conical shaped Type 29 flap wheels and three-ply Speed-Lok discs, the line now includes both Type 29 and Type 27 discs, as well as single- and three-ply Speed-Lok discs. The BLAZE R980 Norton brand products will be exhibited at FABTECH International & AWS Welding Show 2006 in Atlanta. The discs feature a completely new, sharper ceramic grain, improved Y-weight polyester backing, and supersize grinding aid. The exceptional performance of BLAZE R980 discs is due to the outstanding wear resistance of the improved Norton SG grain, which leads to cooler, faster cutting. While traditional grain shapes are "blocky" and do not cut with optimum aggressiveness, this latest generation of sharper ceramic grains presents keener cutting edges to the workpiece. In addition, each grain continually fractures in the grinding process, along sub-micron "faults" in the crystalline structures, to repeatedly expose new sharp cutting edges, resulting in greater disc durability, faster cut rate, and improved finish. The conical shape of the Type 29 Norton SG BLAZE R980 flap discs provides maximum contact with the workpiece and is the best choice when speed is a primary consideration. The new Type 27 flat discs are designed for smoothing flat surfaces. The expanded Speed-Lok line now includes a more flexible single-ply disc. With BLAZE R980 Speed-Lok® discs, operators can change discs quickly, increase grinding time and complete more work per shift, thanks to twist-on/twist-off, tool-free mounting. In on-the-job tests in the metal fabricating, welding, and aerospace markets, where cut rate and durability are of paramount importance, the BLAZE R980 flap discs and Speed-Lok discs have outperformed all competitive ceramic, zirconia and aluminum oxide discs. BLAZE R980 Type 29 flap discs are available in 4½", 5", and 7" diameters with 5/8"-11 hub and 7/8" hole in 36, 40, 60 and 80 grit sizes. The new Type 27 wheels are available in 4½" and 7" diameters in both 7/8" and 5/8"-11 holes, as well as 5" x 7/8" in Type 27 "flat" design, in grit sizes 36, 40, 60, and 80. BLAZE R980 Speed-Lok discs are available in 1½", 2" and 3" diameters and 36, 50, 60 and 80 grit sizes with TR and TS mounts. Single-Ply Flexible Speed-Lok® discs are available in grits 36, 50, 60 and 80, with both TR (Roloc) and TS (Speed-Lok) attachments. All these new products are available in stock, for immediate delivery. 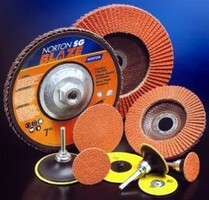 For more information on the Norton SG BLAZE product line or to be contacted by a local salesperson, email ContactNorton@saint-gobain.com, call 1-800-466-1119, or visit sgblaze.nortonabrasives.com. To locate an authorized distributor, visit the Distributor Locator at www.nortonabrasives.com. Norton is a brand of Saint-Gobain Abrasives, a division of Saint-Gobain. Compagnie de Saint-Gobain (Paris) is a leading producer of construction products, high-performance materials, flat glass, and glass containers. The company is also a leading distributor of building products in Europe. One of the top 100 industrial companies in the world, Saint-Gobain's 2005 sales approximated $43.7 billion. In the United States and Canada, Saint-Gobain employs more than 25,000 people, and has approximately 200 manufacturing locations. Web site: www.saint-gobain.com. Address 2: 1 New Bond St.